The planning of health services must be informed by clinical expertise. The Tasmanian Government has recognised this need by establishing a Clinical Planning Taskforce (the Taskforce) to deliver on the Government’s commitment to lead planning for the next stage of the RHH precinct. The Taskforce is an advisory body to the Secretary and provides a vehicle to formalise clinical advice to support Tasmanian health system planning. 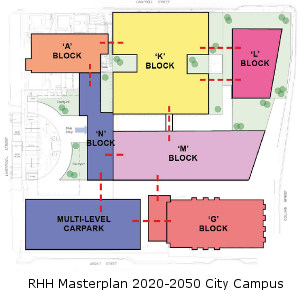 Updating the Royal Hobart Hospital (RHH) Masterplan, to guide the next stage of the RHH health precinct. In mid-2018 the scope of Taskforce was extended to include advising on broader capital and strategic planning for projects of significance to the Tasmanian health system, for example the Launceston General Hospital (LGH) masterplan and overseeing the development of a detailed plan for the delivery of health services in Tasmania. The Taskforce will help us deliver an integrated and cohesive plan for Tasmania’s health system by aligning strategic planning for clinical services with capital and infrastructure investment and workforce requirements. 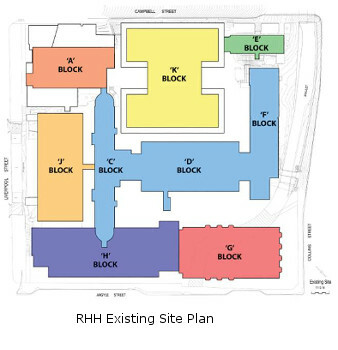 In 2018 the Tasmanian Government directed the Taskforce to begin planning for the immediate future of the Royal Hobart Hospital (RHH) and for the next stage of the RHH health precinct, including the Repatriation Hospital Site. On Tuesday 19 March 2019 the Minister for Health released the RHH Masterplan 2020-2050 and the Government has committed to progressing Stage 2. 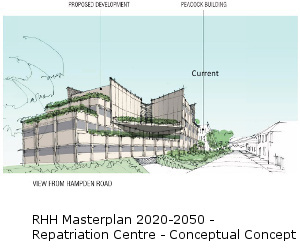 The RHH Masterplan 2020-2050 provides an unprecedented opportunity to meet patient demand, expand clinical services and maximise the of our inner-city assets with the redevelopment of the RHH and the Repatriation Campus. Click here to view the: RHH Masterplan 2020-2050 and Volume 1 and Volume 2 of the Silver Thomas Hanley reports. The Taskforce will now embark on clinical service planning and broader stakeholder consultation that will identify the right clinical bed and service mix of future developments. This page was generated on Thursday 18 April 2019 at 4:12am.